automatic corn flour tortilla chip production line adopts corn, rice, wheat, oat, barley etc as ingredients to make puffed snack. Through friction of screw and barrel, the grains are cooked in the extruder. Forming is at the die face cutter. The product shape is determined by a combination of the die aperture, including ball, tube, stick, ring, fruit loop, star, wheel and flower etc. 4.Adopted the DeLDa inverters, ensure the extruder better running. 1. 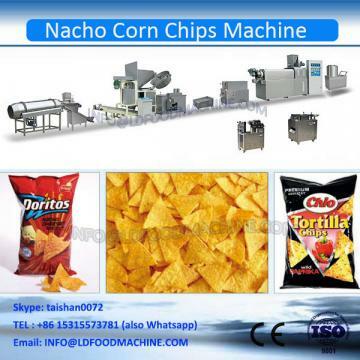 We will give detailed introduction of the tortilla chips make line according to the client Capacity requirement. 3. Desity tortilla chips make line for client according to different requirements. 5. Give detailed instruction manual and video to help the client operation the tortilla chips make line.